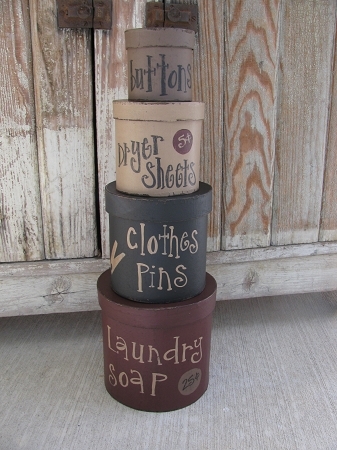 Primitive Laundry Room Set of 4 Round Stacking Boxes. As featured in the Country Sampler Magazine. I love these boxes. 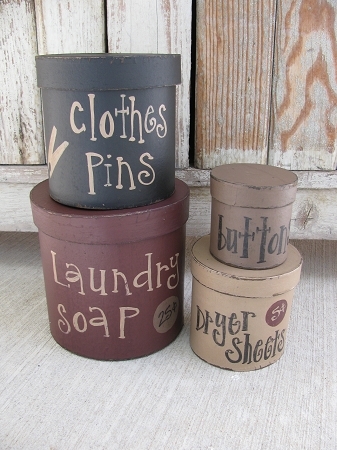 A fun way to dress up that laundry room/washroom! 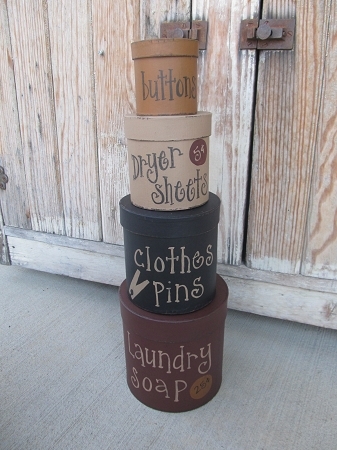 Add these neat/useful boxes to a shelf, cabinet, or top of your dryer. New color option has been added. First photo colors are: Burgundy, Black, Khaki and Mississippi Mud. Second Photo colors are: burgundy, dark navy, khaki, and English Mustard. The bottom box has laundry soap 25 cents, clothes pins, dryer sheets 5 cents, and lastly buttons. Size stacked up is 18"x7". Hand painted, designed by Heidi.